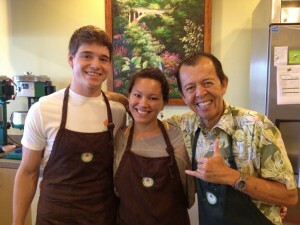 Uncle Clay’s House of Pure Aloha, widely known as “HOPA,” is commemorating their one year anniversary on Saturday, June 9, 2012. In celebration of this event, the “Share-HOPA-Forward” campaign launched this past Saturday. The campaign is designed to aid in sharing pure aloha and shave ice with visitors and the community at large. HOPA’s goal with this campaign is to raise enough funds before the end of the year to share 2,012 shave ice. The “Share-HOPA-Forward” campaign uses a “pay-it-forward” system, which is the concept of asking that a good deed be repaid by passing it on to others. By donating to the “Share-HOPA-Forward” campaign, a person is helping to spread pure aloha, one shave ice at a time. Though donations in any amount and form are welcomed, it will cost HOPA $3.00 to make one “Share-HOPA-Forward” shave ice. Donations can be made in person at HOPA’s Aina Haina location or through their IndieGoGo webpage. To kick off the campaign, HOPA will donate one shave ice ($3) for every shave ice sold during their anniversary celebration on Saturday. Upon reaching their goal of $6,036, HOPA will host “Sharing Days” where the collected donations will be shared-forward through the service of free all-natural shave ice. These “Sharing Days” will be held at “pop-up” locations throughout the island and will provide shave ice paid for in advance by the campaign. During a “Sharing Day,” patrons can simply enjoy the shave ice free of charge or continue the pay-it-forward notion with a donation for another person to be gifted a future shave ice. Not only will “Sharing Day” recipients receive a shave ice, but also a personalized note from someone who contributed to the “Share-HOPA-Forward” campaign. By allowing donors to share their support of the campaign, HOPA hopes to encourage others to participate in the growing deed by sharing HOPA forward. You can donate by going to HOPA’s IndieGoGo webpage at www.indiegogo.com/ShareHOPAForward or by visiting their shop in Aina Haina. For more information on HOPA, please visit www.houseofpurealoha.com or email HOPA@houseofpurealoha.com.